COUGAR announces today the launch of its new compact-format case Conquer Essence. Unique in its premium approach to compact cases, Conquer Essence keeps all the design elements that made Conquer one of the great successes of 2017 and gives them a new life in a compact format. 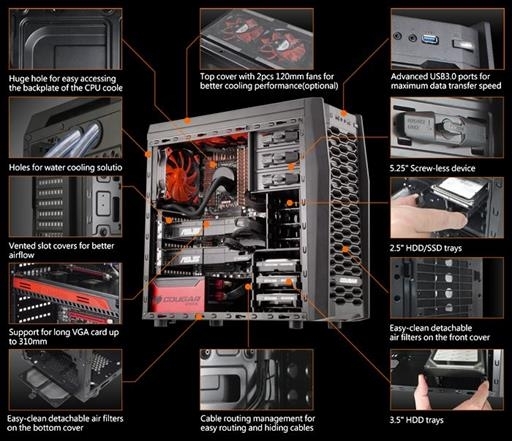 This approach is unique in that it delivers advanced design features in a Micro ATX / Mini ITX case. This new case will start retailing with an MSRP of 229 USD during late July in the US, with launches in the rest of the world following soon afterwards. COUGAR, after having firmly established itself in the PC market, has stepped into the new industry of leading eSports and gaming peripherals markers and is well prepared for the challenge. 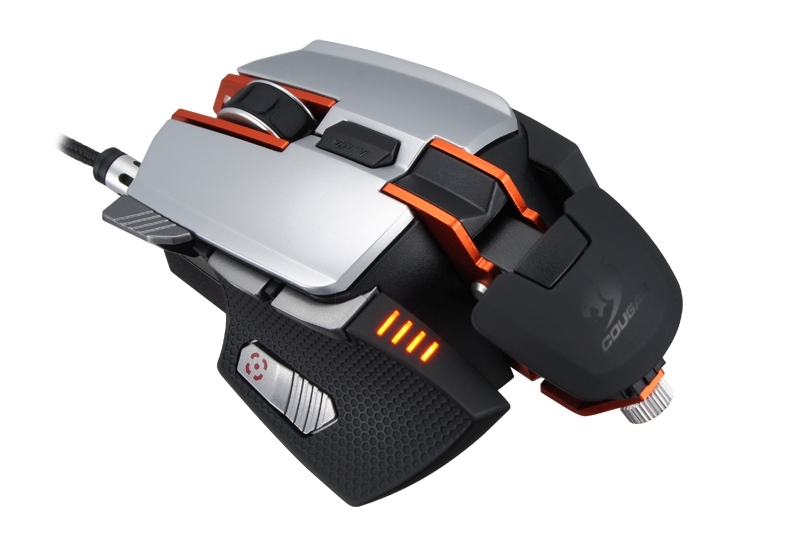 One of the first products COUGAR has just launched is a new PC gaming mouse, the 700M. COUGAR took two years to develop the first aluminum framed gaming mouse, and it has subsequently won the iF (International Design Award) of 2014 and the COMPUTEX Design & Innovation Award of 2014. The iF design awards are considered the design “Oscars” in the IT/PC industry. 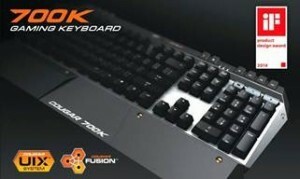 COUGAR, leading PC case, power supply and computer peripherals brand has won design awards for two new gaming peripherals, an ultimate gaming mouse and an ultimate gaming keyboard. 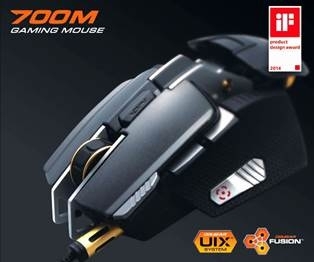 It took two years for COUGAR to develop the first aluminum framed gaming mouse, the 700M and keyboard, the 700K, and both have won the iF (International Design Award) of 2014. The iF Design Awards are considered the design “Oscars” in the IT/PC industry. Design Concept behind the COUGAR Gaming Mouse 700M is one of a “vertebrate” with metal support for “bones”. This allows for customized ergonomic adjustments and players can transform the feel of it in accordance with customary gestures giving the right height. There is also a unique design idea for the side angle sniper button. At 45 degrees, the lateral force can be slower, so this design provides for a more accurate aim. The “magazine” and “muzzle” shape of the cable connector and its strain relief add to a more game-like feel. 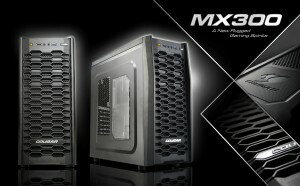 COUGAR, maker of well designed and stylish computer peripherals, has launched a new mid-tower chassis that features a combination of rugged elements consisting of honeycomb and mesh intake designs with sufficient flexibility for multiple graphics solutions up to 310mm. The new MX300 is designed to bring in a new spirit of gaming case. The MX300 features an enlarged cable management space for easy routing and the hiding of cables to provide better airflow and ensure the neatness of system building. It also has superior expandability with up to two ODDs (Tool-less), three 3.5″HDDs and three 2.5″ SSD spaces. There is also the Tool-less design for the 5.25″ devices. The MX300 has a high quality, game-style black coating interior and expandability is not a problem with the advanced USB3.0 ports for maximum data transfer speeds and high current smart phone and tablet charging. And the MX300 features one of the best ventilation solutions with support of up to 7 fans: two 120mm in front, two top 120mm fans, one rear 120mm fan, and two side 120mm fans. 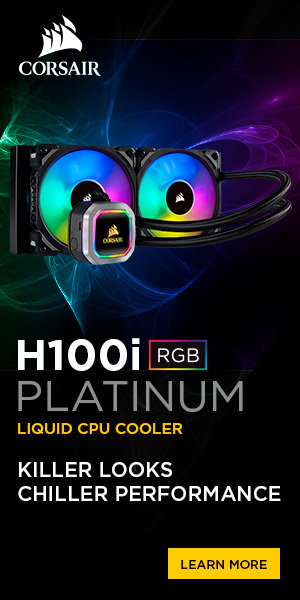 There are 7 PCI slots providing flexibility for multiple graphics cards solutions and openings in the motherboard tray for easy upgrading of CPU coolers. 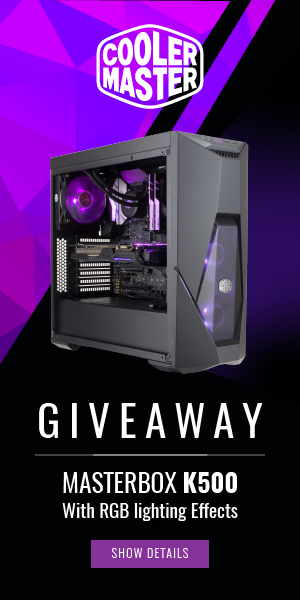 There is also a transparent side cover design to show off your rig. Lastly, there are air filters on the bottom, top and front to prevent dust from entering the enclosure. 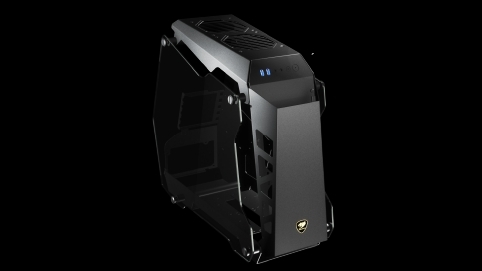 COUGAR, leading PC case and power supply maker has introduced a PC case with great cooling potential and superior capacity, the MX500. With a European style panel design, the MX500 exudes a classic and minimalistic presence. The sleek modernistic look with a hair-lined surfaced front panel design especially makes for a more detailed and delicate elegance. The MX500 mid-tower case is perfect for users demanding a large upgrade ability capacity, with optimal airflow and ventilation characteristics. 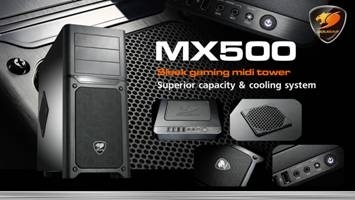 The COUGAR MX500 offers ample space for powerful graphics cards of up to 410mm in length. This is achieved by a unique 3-Mode drive cage concept. In standard mode there is 300mm of space, by using a special HDD track mechanism you can relocate the drive cage to gain another 30mm for a space of 330mm, and when removing it entirely you get the maximum clearance of 410mm.